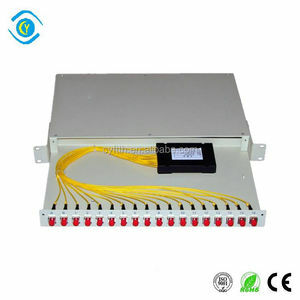 PON network 19" rack mount sc apc 1x32 plc splitter equipped with optical adapter Description 1x32 plc splitter is a type of optical power management device that is fabricated using silica optical waveguide technology. It features small size, high reliability, wide operating wavelength range and good channel-to-channel uniformity, and is widely used in PON networks to realize optical signal power splitting. Rollball provides whole series of 1xN and 2xN splitter products that are tailored for specific applications. 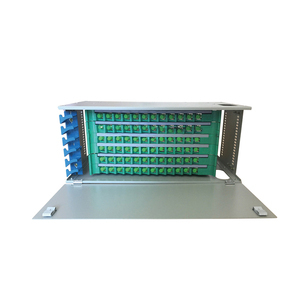 19" 1 * 32 Fiber Optic APC/UPC Rack Mount PLC Splitter 19" 1 * 32 Fiber Optic APC/UPC Rack Mount PLC Splitter is a type of optical power management device that is fabricated using silica optical waveguide technology. 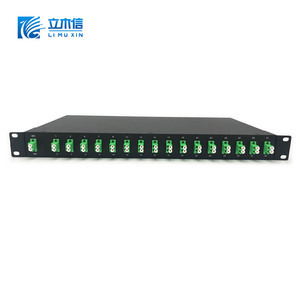 Rack Mount PLC Splitter features small size, high reliability, wide operating wavelength range and good channel- to-channel uniformity, and is widely used in PON networks to realize optical signal power splitting. Fiberlink provides whole series of 1xN PLC Splitter and 2xN PLC Splitter products that are tailored for specific applications. We provides whole series of 1*N and 2*N splitter products that are tailored for specific applications. To meet these, Fiberey has worked hard to streamline our resources and production. It drives us to behave honestly and keep our promises, ultimately winning our customers' trust and respect. 3 YRS Shanghai Changyue Communications Co., Ltd.
(2) 24 core units and 72 core units can be optional according to frame size, the box can be left and right side out cable, flexible operation. At the same time as the cable core to provide the best protection. 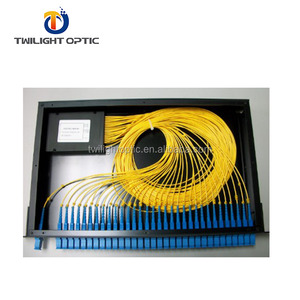 (4)The optical properties to meet the company's fiber optic equipments performance. 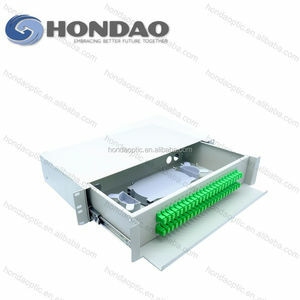 Free sample for test, Optical plc splitter , Rackmounted , 2*16, LC /APC. 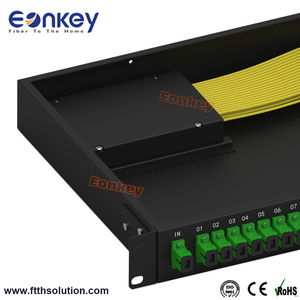 9 YRS Shenzhen CY COM Product Co., Ltd.
19'' Rack mounted Fiber optic patch panel 24 port drawing type terminal box Description Fiber t erminal box could be applied in branch connection of optical cable termination. They are 19" standard structure for rack mounted fitting,sliding design,made of cold-rolling steel sheet. They can be suitable for FC, SC, ST, LC adapter. 2 YRS Puyang YRT Communication Technology Co., Ltd. Product Overviews Welcome OEM & ODM 1270-1610nm rack mount cwdm 16 channels roadm duplex dwdm / cwdm 1.Product Introduction Dense wavelength division multiplexer(DWDM) is based on the membrane filter technique and proprietary non-flux metal bonding micro-optics packaging design, within ITU wavelengths to achieve uplink and downlink. 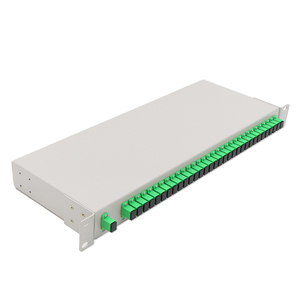 It provides ITU channel center wavelength, low insertion loss, high channel isolation, low power consumption, wide passband characteristics, no glue loop, excellent thermal stability and reliability and so on. 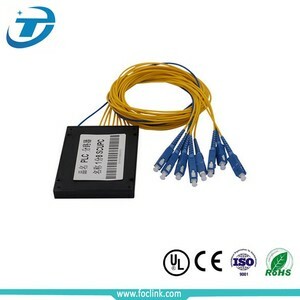 3.Features 1)Low Insertion Loss 2)High Channel Isolation 3)Optical path epoxy free 4)Excellent thermal stability and reliability 5)telcordia GR-1221 Compliance and RoHS Environmental Protection Standard 4.Application 1)DWDM Network 2)Add/Drop System 3)CATV Fiberoptic System 4)Metro/Access Network 5)Fiber Optical Amplifier 5. Order Information Configuration Channel No. Alibaba.com offers 1,858 rack apc products. About 85% of these are fiber optic equipment, 1% are uninterrupted power supply (ups). A wide variety of rack apc options are available to you, such as instrumentation, military. You can also choose from 1, 8. As well as from free samples, paid samples. There are 1,858 rack apc suppliers, mainly located in Asia. 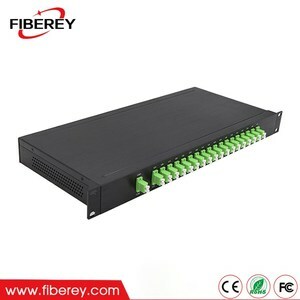 The top supplying country is China (Mainland), which supply 100% of rack apc respectively. Rack apc products are most popular in South America, North America, and Domestic Market. You can ensure product safety by selecting from certified suppliers, including 868 with ISO9001, 212 with Other, and 117 with OHSAS18001 certification.